The following pages show a selection of photography which I have taken over the last few years. My main tool of the trade is a Panasonic G2 Micro four thirds camera with a 14-42 mm lens and a 20mm prime lens f1.8 (Shown Left). 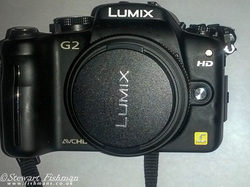 I also have a Panasonic-TZ7 Compact for when the G2 is too big to take with me. 500px.com/ - great site for inspiration. Shows lots of Amazing photos, taken by others round the planet. One useful thing I have found is that if you search by your camera model, you can see images of how far it can be taken. http://www.karltaylorphotography.co.uk/free-photography-tips-tutorials.htm - you have to pay to get into the detail, but the free video tutorials he gives, are great for getting you starting to think like a photographer. http://www.photobox.co.uk/ - site for printing images. Many out there, so it will be personal preference to some extent. But this one has always done me well.